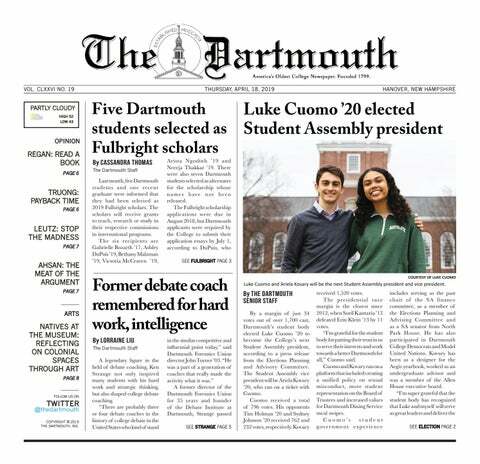 As a tour guide for the admissions office, prospective students and parents alike ask me why I chose Dartmouth at various points in the hour-long tour of campus. Sometimes when I’m in the middle of a sentence. The question is clearly on their minds as they anticipate this difficult decision in their own lives. Even in my fourth and final year here, I still engage in conversations with my friends about our paths to Dartmouth. The conversation never gets old, and neither does the question. Each story is unique and interesting, serving as a reminder of how privileged we are to be here and to have friends from all over the country and the world. Yet for some reason my friends and I rarely break down the decisions about our future career paths the same way. My friends and I don’t compare our employers’ firms, like we do with elite colleges and universities. And when it comes to a specific job, we assume that our professions reflect our passions. Identifying these passions is supposed to be the easy part of the process, arguably the very beginning of the process from which all professional decisions are made. If only it were always this easy. Four years ago, I had exact reasons for attending Dartmouth over other schools. It didn’t matter that I did not know exactly what I was going to do with my time here once I arrived. Similarly, I rarely had to ask myself why I was doing something in high school. At least in my high school community, it was so commonly accepted to do whatever it took to strengthen one’s college application. This game has changed throughout my four years here. The professional world is not the kind of concrete end result that college was four years ago. Colleges fit into unique stereotypes, but different industries operate on different time frames, sometimes depending on the location, and sometimes within different cultural standards. Facing a new kind of end game, we as students are forced to re-examine the means to that abstract and ambiguous end upon graduation. What are we as individuals willing to do to reach our specific goals? What goals must we create for ourselves to be truly happy and healthy, once we are settled into a world of complete independence? A major selling point of Dartmouth, I think, is the fact that any kind of grade on a paper or midterm exam is simply not socially relevant. It is accepted that everyone does well, or well enough, in the classroom, so talking about grade point averages draws discomfort. Our quarter system produces more rounds of assessments and scores. Students often turn to extracurricular activities to distinguish themselves in addition to their studies. The resources available to Dartmouth students, in and out of the classroom, support both of those choices. I was the kind of college student who navigated several difficult classes before finally settling on a major. I treated my first year on the swim team here as a year of survival, doing whatever I could do just to finish the season. It was never an option for me to fail a class or fail my commitment to the swim team. What’s important is that I eventually determined my major, which I have loved, and that I was able to do more than just survive on the swim team. In both areas of my life, I eventually found success by reevaluating my goals. Under this logic, there is no such thing as failing the real world. And under this logic there can be no such thing as a single social good. It is difficult to say with certainty what is good for society because our understandings of good and success are so subjective. A consultant is unlikely to define the social good in the same way that a social worker might. Therefore, personal fulfillment has to come first. What is done with the fruits of such fulfillment is what benefits the so-called social good. I do not mean to manipulate this column to preach my own set of values. As college students we will all at some point have to come to terms with our choices as they begin to shape the rest of our lives, both in professional and personal contexts. College is the time to find oneself, supposedly, the time to develop a strong moral and ethical code from which all other important life decisions can be made. Society generally defines employment as the light at the end of the four-year tunnel that is college. “Seeing the light” means securing a job. But society does not standardize what we see on the other side of the tunnel. The light is what we cannot see.